Success depends on effort and action. Successful people keep moving, they may suffer from failure to failure but without loosing enthusiasm. 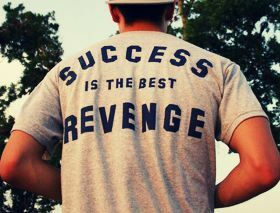 They succeed because they they keep themselves motivated, and remain determined for positive outcome. Remember you are unique you have everything you need to be success, move forward, and stay determined. If one is true to himself, he drives strength to fulfill his commitment. In the process he builds confidence to moves forward. Success comes to those who believe in their talent and have self belief to pursue dream. Enthusiasm is like an electric current that keeps the engine of success constantly in motion. Don't look back when you are moving to success. But don't forget to look back after reaching success. Don't be afraid to think big. Broaden your horizons, set the bar high, demand a share of the profits. Just stride forward with confidence and you will see the results and successes.